Once more: nothing subtle here. Mechanicles wants to take over the world for no stated reason, and though he dislikes messes has no problem with creating quite a stupendous mess with his mechanical bugs. More importantly, Aladdin here becomes an incompetent jerk for no reason but that the plot demands it. He’s entirely too egotistical to be believed. 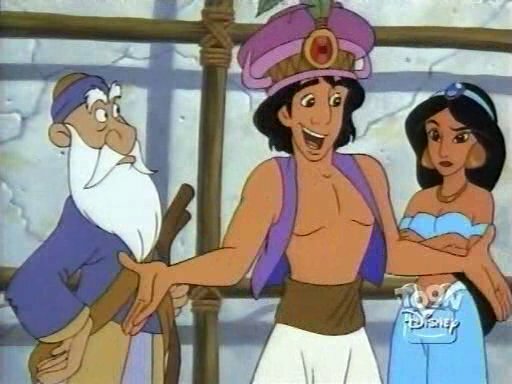 Aladdin in this episode is rude, arrogant, and too stupid to see he's wearing a pot on his head. Incidentally, Mechanicles quite reminds me of The Mechanist from Avatar: The Last Airbender. I guess maybe he’s fitting a more general ‘crazy inventor’ character design, but I can’t think of others off the top of my head. Anyway, Aladdin eventually discovers he’s been acting like a jerk, and with this realization, becomes once more competent and saves the day. 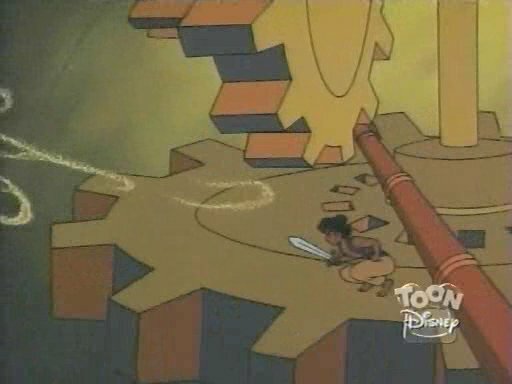 Aladdin recovers well enough to disrupt Mechanicles's giant steampunk insect tank. This is another episode that presents its story well enough, but that fails to be more than mediocre. Why does Aladdin act the way he does? Who cares. Once the episode is over, there’s no more need to think about it. This entry was posted on July 10, 2011 at 3:51 am	and is filed under Review, TV Episode. Tagged: disney, steampunk, toreview. You can follow any responses to this entry through the RSS 2.0 feed. You can leave a response, or trackback from your own site. I always felt that the best episodes were the Iago-related ones. I always felt that he’s the character with the most consistent personality. You know, he can be greedy and mean and sometimes he doesn’t learn his lesson at the end, but his conscience always wins out.